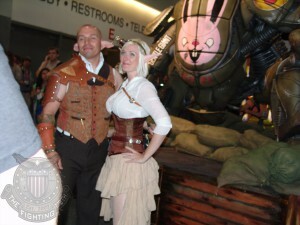 SDCC 2011 – First Time Experience | The Fighting 1:18th! Well, SDCC h as come and gone and it was quite the experience. From getting up obscenely early to wait in line to seeing exclusives and talking to vendors it was all a great time. This being my first time I was not really sure what to expect but luckily I had a seasoned veteran with me. To start off my trip I had to meet up with a friend to get a ride there. I was lucky in that regard because the drive was quite a haul. We left Napa, CA at 7AM to start our trek. We made one stop for lunch in the middle of nowhere and then hit L.A. traffic right at rush hour. That was quite an experience for about 2 hours. After that, we got to San Diego around 6PM. Once we were in town I contacted NSA and we met up at the convention so I could get my badge. I just made it under the deadline for the day and got to walk around for a little bit and get a lay of the exhibition floor. View from the line at 6AM Thursday. This was just a taste of what was to come the next few days. 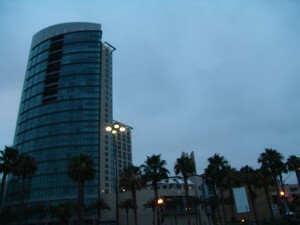 On Thursday I left the hotel at 4:45AM to get to the convention. I was told people line up early and did not want to take any chances. Well, they did all right. There were individuals that were camped out there. I was about 150 people back at that hour of the day. I called NSA around 5AM to let him know I was on my way and he met me there around 5:30AM give or take. From there was the waiting game for the doors to open at 7AM to go to another line. Once they opened we went straight to the sales floor to wait in the next line for Hasbro toy shop. They would not let it move until 9AM. Now this line was just to get a ticket to wait in the exclusives line. We were not even at the exhibition floor yet. Once we got our ticket we went through the cattle gates and joined the herd. Well, kind of. As we were checking the line it started moving and we managed to slip in with the masses about 2,000 people ahead of where we would have been. Now, since all that was done it’s time to get to the floor. We went straight to the Hasbro toy shop booth and started to wait. There were already exhibitors there getting stuff before the masses. No biggie since we were there super early. We knew we were gold for what we wanted. So after about 2 hours in that line we finally got our stuff and checked out displays. About time after about 5 hours in lines! First place we went was to see all the Hasbro items. They had a display with a vintage G.I. JOE USS FLAGG with a bunch of new product on it. There was really nothing new to show off so we started to see who we could ask questions to. We ran into the designer of the figures and talked with him for a while. It was an interesting conversation and was nice to hear how they came up with some of the ideas for the Pursuit of Cobra line. After that booth we went to Merit to see what was new. Not really any new information from them but they did offer some great insight into how the 1:18th world is going. Not really to bright unfortunately. 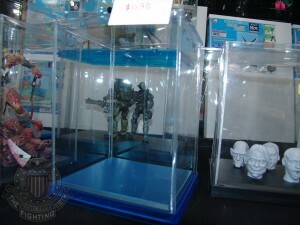 They did have some nice display cases for models or whatever you would want to use them for that folded down and the price was very reasonable I felt. Merit did have the “Black Knights” F-14A on display in their booth. After the outdoor tour it was back to the floor to check more stuff. You really can’t take it all in at one time. It’s best to get the exclusive wait out of the way and then you can enjoy the show a lot more. We scoped out the Hasbro booth again to try and extort a little more information out of who we could. Then we just trolled around and checked out other booths and fought crowds. After that it was back to the hotel to meet up with some friends and check out the town. The next day was pretty much a laid back day for us. We got what we wanted the day before so it was time to really see everything we could. This was my last day there so I had to scour the entire floor. There is so much that is happening you almost can’t pack it into the two days I had. Once we got tired of the exhibition floor we went back to the outdoor events. The weather was a perfect mid 70’s the whole time with a nice ocean breeze. It’s really a great place for them to hold this event. In closing, I had an awesome time! It was great to meet a few people I’ve been dealing with on the sites and to see how this whole event happens. Despite the horror stories I’ve heard there was really no issue I ran into but I did prepare for the worst. I am looking forward to doing this again next year. Previous: SDCC 2011 – Hasbro Booth – Final Thoughts! Next: Big Lots is back!